This week’s session of the Shrewsbury Boardgames Club will be on Friday 20th March and will take place at Garry’s house. Just a quick note to confirm that this week’s session of the Shrewsbury Boardgames Club will take place on Friday 6th March at Garry’s house. Bonnie and Clyde is the fifth game in Mike Fitzgeraldâ€™s Mystery Rummy series and has been a long time coming â€“ originally set to be released in 2005 by US Games Systems and then lined up for release at Essen in both 2007 and 2008, it has finally appeared in late February 2009, published by Rio Grande. Was it worth the wait? Yes, I think so. This is somewhat different from the other four in the series as it also incorporates a small board displaying ten locations tracking the history of Bonnie and Clydeâ€™s exploits from a bungled robbery in Kaufman, Texas in 1932 to Gibson Louisiana in May 1934 where they died under the smothering fire of the sheriffâ€™s posse. There is some nice background text under each location (in English in both Rio Grande and Abacus versions) but this has no relevance to the gameplay. There is also a wooden marker for use on the board, a bright orange getaway car. Apart from that, you just get a deck of 77 cards in nice quality cardstock, typical of the major German publishers â€“ the game was printed in Germany. There are two types of cards: 10 sets of evidence cards matching the location with six cards in each set. A nice touch here is that the illustration of each card in a set is slightly different and forms a sequence of â€˜film stillsâ€™ tracking the getaway scene. The other type of card is the Ted Hinton card of which there are 15, identically illustrated. These are the equivalent of the gavel cards found in the other Mystery Rummy games. 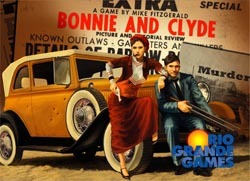 The deck is rounded off with a Bonnie card and a Clyde card, which will give lots of points if you capture one or both of them during a round. If you have played the other Mystery Rummy games, the play follows the usual format of drawing a card, optionally playing cards and finally discarding. You draw a card from either the top of the draw pile or the top discard. You may then play melds of three or more ofÂ a particular evidence card; you can lay off evidence cards of previously played melds, laid by you or another player; and you can play at most one Ted Hinton card. When you play melds or lay-offs, each card you play will be worth 2 points unless the card you play matches the current location of the getaway car, in which case you lay the cards horizontally and they are worth 4 points. You also get to search the location of the cards played and move the getaway car. If you play a card of the location where the car is situated, you look at the card and can either keep it or replace it. If it is Bonnie or Clyde, you place it in front of you and it will score 10 points for you at the end of the hand. If the card you play does not match the carâ€™s current location, you have to replace a Bonnie or Clyde card but can choose to keep or replace any other card. With each meld and lay-off you play, you move the getaway car: melds force you to move the car forward on location but with lay-offs you can choose to move forward or backwards one space. I enjoyed Bonnie and Clyde a lot as it has both the familiarity of the other Mystery Rummy games and the novelty of how you use the game board to your advantage. There is the dilemma of whether to get your cards down quickly or wait until the car can be manoeuvred to the right location. Waiting may get you more points but playing cards gives you more control over how the car moves and the possibility of identifying where Bonnie and Clyde are hiding. Of course, your play is somewhat dictated by the cards you are dealt. A hand with a lot of Ted Hinton cards gives you some nice flexibility early on but they donâ€™t get you points directly. Holding back lay-offs until you can play a series of them to manoeuvre the car for a double-points meld or to trap Bonnie or Clyde is a good tactic unless someone beats you to the punch. Also, trying to position the getaway car for the end of the hand bonus (further along the track if you think you could go out or backwards if you think someone else will do so) is another consideration. Iâ€™ve played only once with three players and it works very well with that number. With two, I suspect there is more emphasis on holding back cards to get one or two big plays, whereas with four, it is probably a bit more of a race to go out before the others so each hand will be quicker and lower scoring, with more hands needed to complete a match. Our three player game took four hands and ended with victory by a single point. Overall the game is nicely produced and is a welcome addition to the collection (at last!) The one downside for some especially in the UK will be price. Â£20 (or 20 euros / $25) for little more than a deck of cards may put those on a tight budget off. However, this is an enjoyable light game that is good in a family setting but does have enough going for it to be played with your game group.